This morning I received a much anticipated email from VMware Certification. It had been almost three weeks since re-sitting my DCA exam and I was extremely nervous about the result. Anyway, three months went by and I geared up once more to attack the beast. I sat the exam at the same testing centre in sunny Tauranga, New Zealand (seems to be the ONLY place you can actually book the exam in NZ anyways). This time the lab environment seemed much faster at responding and I found myself getting through questions far quicker. To be fair I had also put more study into the areas that I had clearly lacked from the first attempt and this made a lot of difference. The exam was still extremely tough and it was clearly a very different set of questions and lab setup from the first time. I managed to run out of time with about five questions left completely unanswered. I still felt very nervous about how I did but hoped that I had done enough to pass, in this case more than 300/500. My first attempt came in at about 250/500 but I had only answered about 60% of the questions, so I was hopeful that this time was much better. So, this morning I was up at about 6am with my two boys, half asleep sitting on the couch. I’m on my phone using the web browser to view webmail (don’t ask!) and the attached pdf result wouldn’t download!!!! Then when I finally managed to get it to download it wouldn’t open the pdf, argh!!!!!! I finally got the thing open and scrolled down to the score…389/500, woohoo! I was so stoked, I really didn’t want to have to sit it a third time! Now that I have both DCD and DCA I can now apply for VCDX. This will be my next major goal and realistically will take me some time. Between a busy job and family life there ain’t a lot of time left for preparing a design, but lets hope that through work I can prepare one suitable. 2. Check out Jason Langer and Josh Coen’s study guides here: http://www.valcolabs.com/vcap5-dca/ and here: http://www.virtuallanger.com/vcap-dca-5/, both of these guys fricken rule! Many thanks to them for their massive efforts in creating such a great resource. 3. Use Autolab for creating your home lab environment, it will save you a heap of time: http://www.labguides.com/. A BIG thanks to Alastair Cooke for his work and others that have helped him. It is a fantastic tool for deploying vSphere at home. 4. Make sure that you don’t skip over areas that you think you already know. I did this both times and realised afterwards that I didn’t really know as much as I thought I did! 5. During the exam, manage your time very carefully. Don’t stall on any one particular question too long and if you get stuck, move on and come back later. 6. Oh, and lastly, if you do fail, don’t beat yourself up. It’s a real tough exam with a lot of content to work through in a short space of time. I was way too hard on myself the first time and this put me off getting back in the drivers seat for a long time. Sometimes it is good to fail and gives us perspective. Nice article. I sit for mine in about a month. 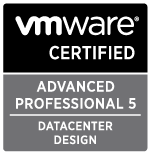 I recall vividly the beating I gave myself for failing the VCAP5-DCD the first attempt (after having passed the VCAP4-DCD first time around)…so I feel your pain there. Nice work… and good luck on your VCDX design and defense!